Our Canadian Thanksgiving is coming up on Monday and I know I'm not alone in thinking that it came around so quickly this year. We had warm weather through most of September so it felt just like the summer we didn't get in July and August. Nevertheless, Thanksgiving is just about here and it's the perfect time to gather with family and friends to express thanks for all of our blessings. Family is the biggest blessing of all, and thanks to my wonderful in-laws, I'll be enjoying an incredible meal that I don't have to cook. However I thought I'd set a simple, pretty Thanksgiving table and have a nice pre-Thanksgiving meal with my immediate family. We like to make an easy tofu loaf or cook a store-bought Tofurky roast to have alongside mashed potatoes, baked sweet potatoes and cranberry sauce. 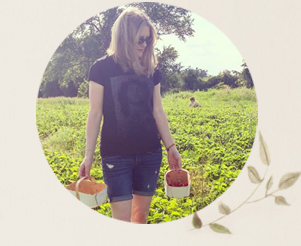 I'm also grateful for the wonderful women in the Year of Feasting blogging group. 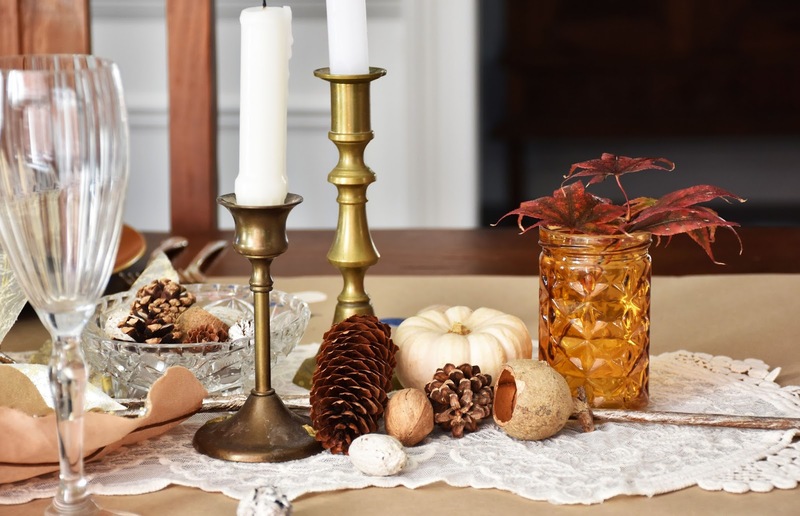 Today's post marks the fall edition of Year of Feasting, when the bunch of us, led by Dannyelle at Life is a Party, share our ideas for seasonal party decor. Find more decor ideas through the links at the end of this post. I have to say that, since we made over our dining room for the spring One Room Challenge, I've been much more motivated to set the table nicely. The room is fresher and brighter and more fun to be in. 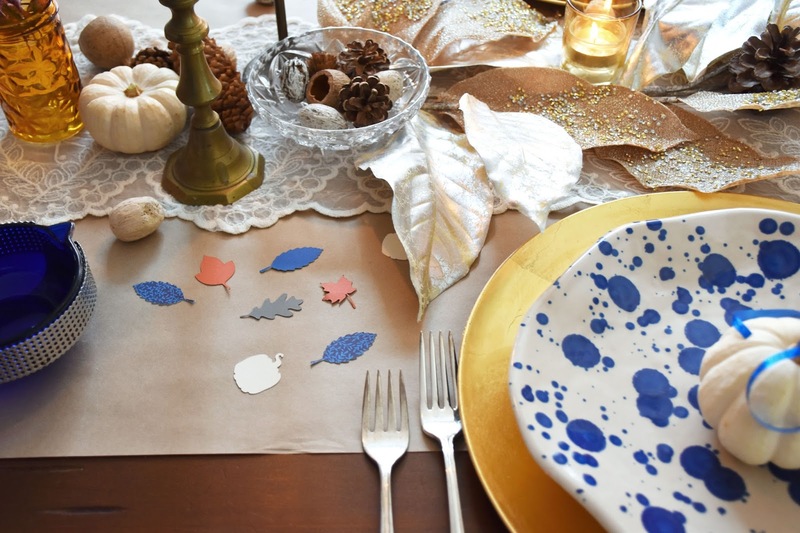 That being said, my goal with this simple Thanksgiving tablescape was to set the table using only dishes and decor items that we already had around the house. Lord knows I have enough of them already! I did recently buy these lovely blue-spotted, hand-painted plates at IKEA though. They were reduced to $1.99 each, so how could I possibly resist? They became the inspiration for my Thanksgiving table. I love the combo of blue and gold, so I laid the plates on gold chargers. 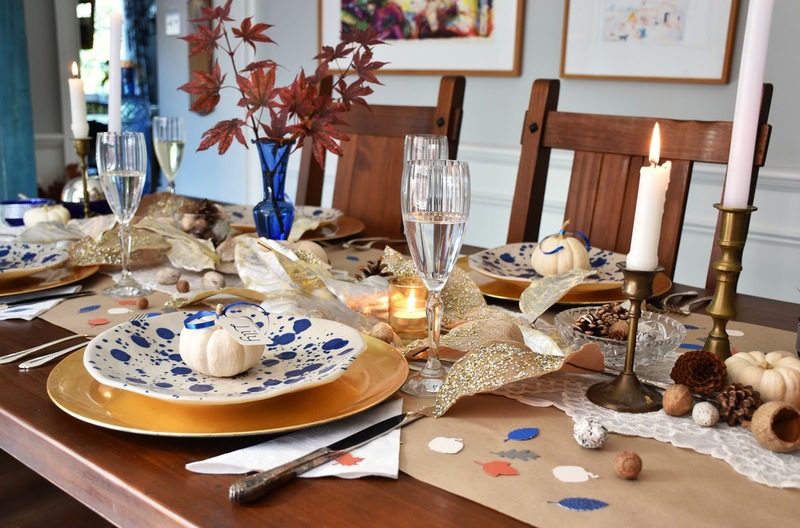 As I generally do, I mixed contemporary pieces (like the IKEA plates) with vintage pieces (brass candle holders, silverplate cutlery and crystal serving dishes). I also mixed casual elements with more formal elements. First I rolled out Kraft paper as a table runner. Then I laid an Afloral lace table runner on top to soften up the look and add texture. I also had some Afloral gold magnolia leaf sprays left from last Christmas (when I used them as a tree topper). I laid two of them across the middle of the table. 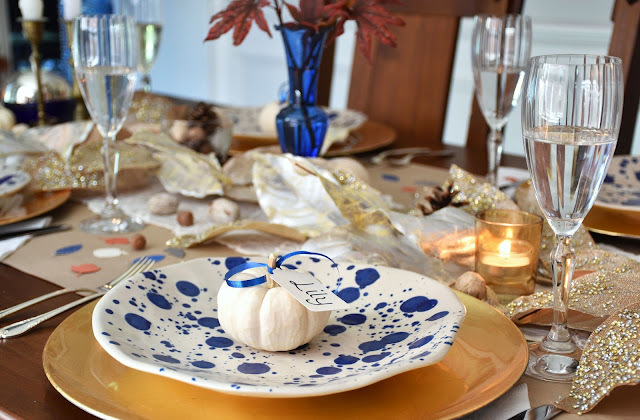 I then decorated with natural elements such as pine cones, nuts and white mini pumpkins, some in crystal dishes and some simply on the table. I thought that white mini pumpkins looked sweet on the blue-spotted plates, so I put one on each plate. Then I cut place cards using my Cricut Explore Air™. I had the Cricut do the writing of the names as well, as the machine writes much more prettily than I can. 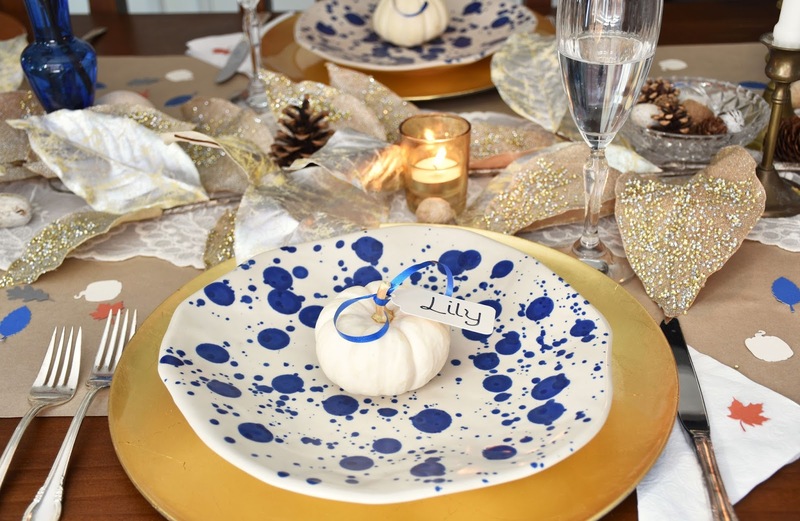 I tied the place cards to the mini pumpkins using shiny blue ribbon left from Christmas. Easy peasy. My Thanksgiving centerpiece couldn't be easier. 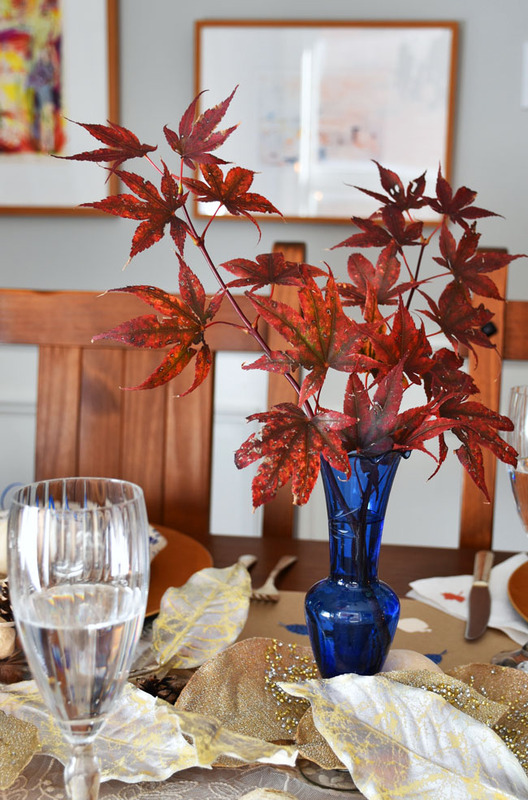 I found a vintage blue glass vase and popped in a stem from our Japanese Maple tree. Fast and free. 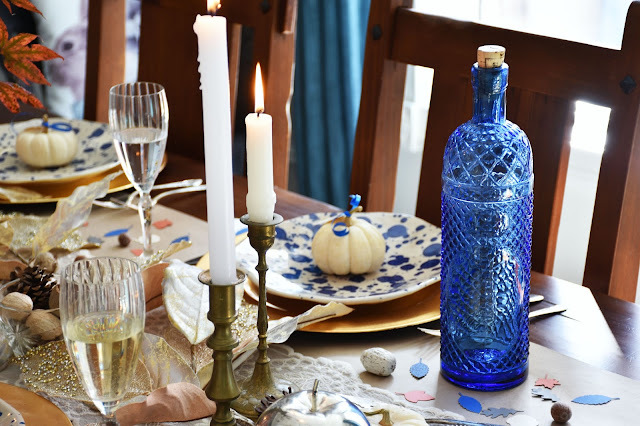 I went around the house in search of blue glass, like this bottle (above), because I felt like the table needed more blue accents to go with the plates. We have plenty of different kinds of glasses in the dining room armoire. My daughter chose champagne glasses. We filled them with sparkling soda for the kids and white wine for Mom and Dad. Fill the glasses, light the candles. All that remains is getting the Tofurky and veggies out of the oven and mashing up those potatoes! I hope that I have inspired you to go around your house (and garden) in search of dishes and objects with which to decorate your own Thanksgiving table. A dressy, special occasion table need not be difficult or expensive. How about you? Where are you celebrating Thanksgiving this year? 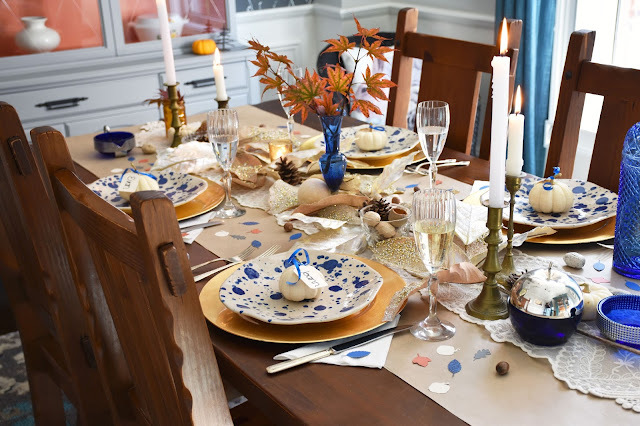 If you're hosting, how will you decorate the table? Kim Power Style || Vin'yet Etc. Very inviting, a beautiful table. I love that our Thanksgiving is in October. We celebrate the harvest and enjoy and appreciate all the beauty of autumn. Its the last holiday of the year when we can get together with friends and family before the snow flies. 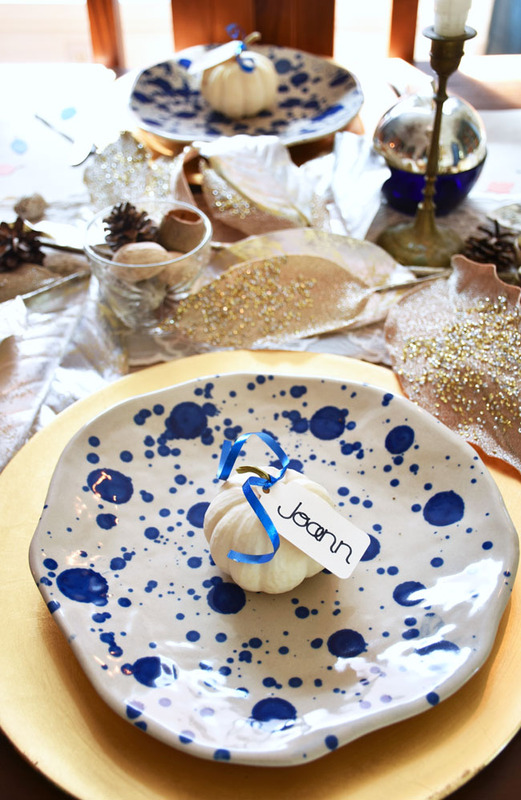 Loving the colours Jo Ann and those blue spotted plates! 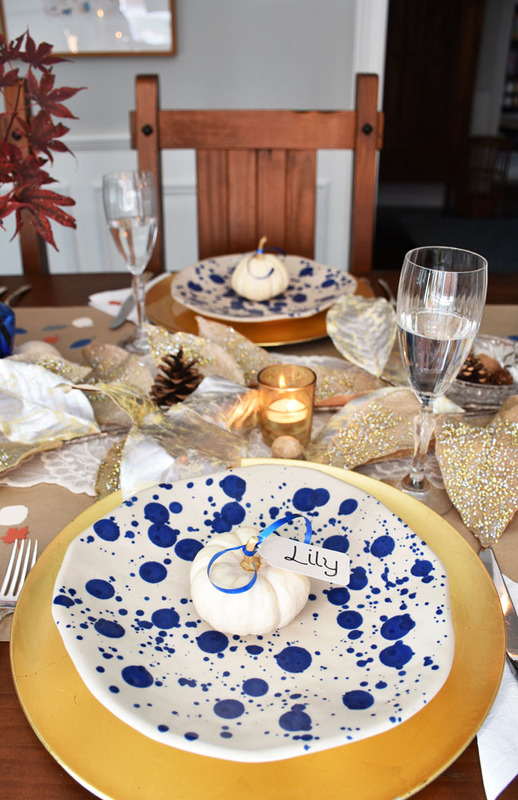 Beautiful tablescape and oh those little whit pumpkins with the name tags. Happy Thanksgiving! What a pretty table, love your unconventional blue and gold for fall. Those plates are so fun and I see why you couldn't leave them in the store, haha. Thanks so much for joining in and Happy Thanksgiving! Thanks Dannyelle! Definitely - the plates had to come with. 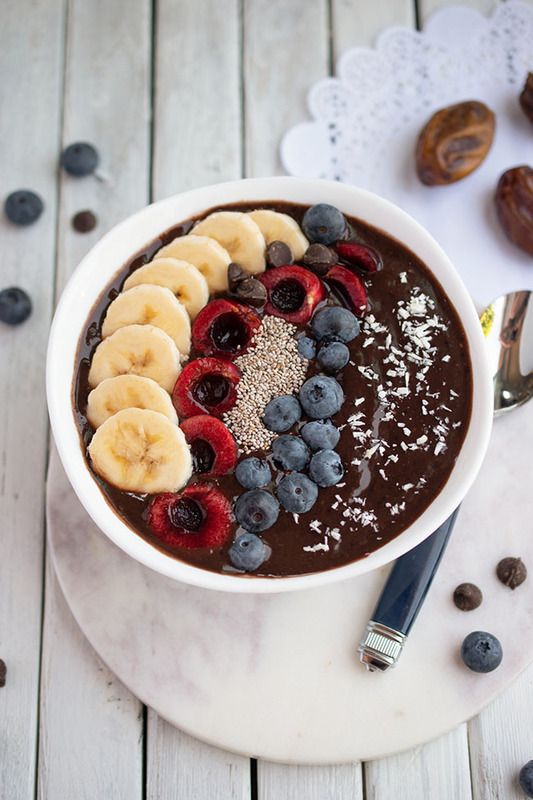 ;) Thanks so much for hosting! Happy Thanksgiving to your lovely family! Lovely tablescape. Love blue. Celebrating Thanksgiving. Getting together with family and friends. Happy Thanksgiving! Enjoy the long weekend as well. I love your colour palette - blue is so great for every season, but pairs particularly well with fall reds and brass. Using those leaves was the perfect autumnal touch. Gorgeous! Just beautiful. How I wish it were autumn here, spring isn't so bad but it means summer and that I do not like! I have dreams of decorating our table but with our cats we can't have anything, not even flowers as they chew them to bits and knock stuff over!